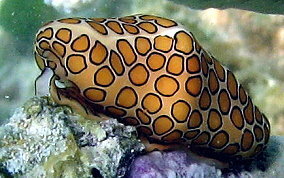 The flamingo tongue snail feeds on toxic sea fan polyps. The snail itself is immune to the toxins, but it's body absorbs the venoms and the snail becomes toxic to would-be predators looking for a meal. Although shell collectors may be attracted to the colorful snails, the shell itself is just white. 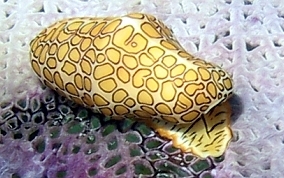 It is only the living animal inside the shell that gives the shell it's spotted patterns.